Wormcast (or Vermicompost, or Biohumus take your pick) is such a valuable addition to the gardener’s ‘toolkit’ that using it alongside our other natural, organic aids like Mycorrhiza, Seaweed and Neem when you are planting your vegetables, shrubs and flowers will almost guarantee you a wonderful display or crop. But how about if you want to give your established plants something extra ? Extra, but organic, natural, and totally artificial chemical free ! Well, clever clogs that I am, I know just the stuff. 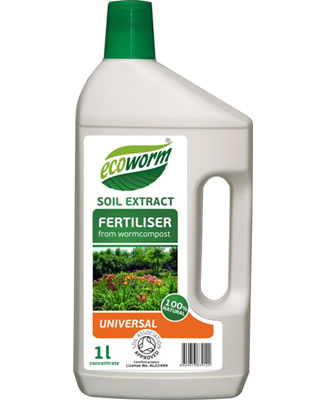 ‘Soil Extract Fertilizer from Worm Compost’. O.K., so the name tells you what it is, but why should you use it ? Well it has all the good stuff from wormcast, but it is a liquid and so easy to apply to your established plants. It’s really a highly concentrated extract of Biohumus, containing all of the essential ingredients that plants need. Stuff such as the three essential acids - humic (loads) fulvic and amino - plus all the macro and micro elements, natural soil antibiotics, fitovitamins and micro organisms that your plants need. And they can absorb all of these essentials so easily from this liquid totally organic fertilizer. All of these elements help with, and really are so necessary for, germination and healthy root growth. To say nothing about helping your plants take up nutrients really efficiently. Well, you now know why you should use it, but how would you use it. First you simply dilute it in water (lukewarm water is best) the dilution ratio depends on what you’re particularly aiming to achieve. Garden Plants – Every 10 days during vegetation period. Indoor Plants (excluding Cacti and Succulents) – Twice a month. Humic acids 0.6 – 0.75%. N-P-K : 0.7% – 0.6% – 0.8% . Trace elements: Fe, Zn, Mg, Mn, Mo, Co, Na, Se, Va, B, S, I, Cu. Ph : 7.5 – 8.5. Can’t think of anything else to say really, apart from it’s the most natural concentrated organic fertilizer I have been able to find.